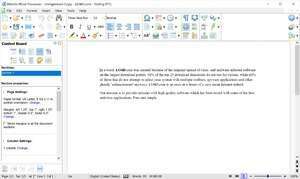 Atlantis Word Processor is a cheap, affordable, yet feature-packed word processing application which serves as a great alternative to paid-for programs such as Microsoft Word, Works or Corel Office. Atlantis includes virtually all of the most-used features of any word processor and packs it all into a layout typical of any modern word processor. It supports rich text, images, spell check and also supports the encryption of documents using some of the strongest 256-bit encryption algorithms. The spell checker included with Atlantis Word Processor features AutoCorrect which helps you keep your document correct from beginning to end. Atlantis Word Processor 3.2.13.4 is a shareware program and can be used as a demo to try the software until the free trial period has ended. A full version of the program is available after the trial period ends. For security reasons, you should also check out the Atlantis Word Processor download at LO4D.com which includes virus and malware tests. Additional screenshots of this application download may be available, too.